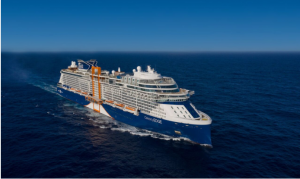 The most anticipated ship of the year, Celebrity Cruises’ billion dollar Celebrity Edge has launched in Fort Lauderdale, Florida, ready for her maiden guest voyage on December 9 2018.
o At the summit of the ship on Deck 16, the Magic Carpet becomes the ultimate specialty restaurant offering a special “Dinner on the Edge” for 90 guests. 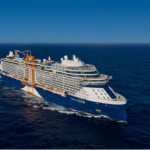 o Alongside Deck 14, Magic Carpet becomes an open-air expansion of the main pool area. o At its lowest position on Deck 2, Magic Carpet is a key component to the Destination Gateway, a luxury embarkation station where guests will be whisked away aboard sleek tender ships called Edge Launches. · Split-level Edge Villas, which offer stunning views from two stories of windows, private plunge pools and direct walk-out access to The Retreat Sundeck. Hoppen also designed the two two-bedroom, two-bathroom Penthouse Suites with large soaking tubs on the veranda, large dual walk-through showers, and expansive walk-in closets, and the 146 large, outward-facing Sky Suites. All suites and double occupancy Edge Staterooms are fitted with exclusively designed plush king-size cashmere mattresses – an industry first – and offer personal butler services and access to The Retreat.